Tuna fishing is popular in ALL the eastern coastal states though bluefin are limited to the cooler waters in the mid-Atlantic and northeast. The two most popular species of tuna are the Yellowfin Tuna and the Bluefin Tuna. The Yellowfin Tuna (Thunnus albacares) reaches a maximum size of 450 pounds. 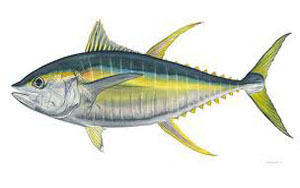 Yellowfin have football shaped bodies, dark blue or black above with yellow on the sides and fins tinged in yellow with the finlets yellow. Yellowfin occur in both the Atlantic and Pacific Oceans. Yellowfin Tuna are schooling fish and are the most important commercially of all the tunas. Tuna fishing can be very demanding. Tuna are some of the toughest fighting fish in the ocean. Serious tuna anglers focus much of their attention to making sure their tuna fishing gear is capable of subduing these fish. Click here for our recommended Tuna Tackle. There are many tuna fishing techniques. Yellowfin tuna and smaller bluefin tuna can be jigged, trolled, plugged, chunked, and targeted using poppers. Though giant bluefin tuna can be caught on the troll, they are most often caught on whole dead baits and live baits. Do you Dare? Giant Tuna on Stand-up Gear – by Capt Andy LoCascio. Everything you need to know for catching giant bluefin tuna on standup gear. Giant Bluefin Tuna – 1100lbs+ in 45 Minutes – by Capt Andy LoCascio (Includes video). Giant bluefin tuna techniques and tips when using a fighting chair. Bluefin tuna and yellowfin tuna are only rarely found in the same waters, though they can often be found in the same regions. Bluefin are typically found in near-shore waters and very rarely close the beaches. However, giant bluefin tuna can be found surprisingly close to the shore especially in Canadian waters. Yellowfin typically prefer water waters and bluefin are very comfortable in cooler waters.